We really like sauces at my house. Well, I like them. I like them more if they're one-of-a-kind, use unique ingredients and are local. All of the sauces in this post meet the prerequisites. First, Nello's Sauce: Provençal Pomodoro. Without a shadow of a doubt, this sauce is the single best-tasting tomato sauce I've ever had. When I opened the jar, I put my nose in the jar and fell in love. I dipped in a spoon and I couldn't stop eating it cold and raw from the jar. It puts all of the national brands to shame. They SHOULD be shamed, because there's no reason why sauce this good isn't in every home in America. WOW. I just opened the pomodoro @NellosSauce & it is the best tomato sauce I've ever eaten. My spoon won't stop dipping in it. Why is it so good? Well, it tastes like fresh tomatoes from the vine. The hook, the key, the puzzle piece that makes the Pomodoro the best ever is the N.C.-grown organic lavender shining through the plume of the plum tomatoes. I've never tasted anything fresher. You need to order some today. Or enter to win the contest! Pasta, sloppy joes, bread, meatloaf, jambalaya, pizza, for dipping, and even as a rib sauce--this sauce needs nothing added to it, except your mouth! Next, Three Juiced Bootleggers Grill N' Marinade. Lots of secret herbs, spices and molasses flavor this marinade. It's dark, deep and can be put on anything and I'm going to be honest: It looks like a jar of tobacco chaw. 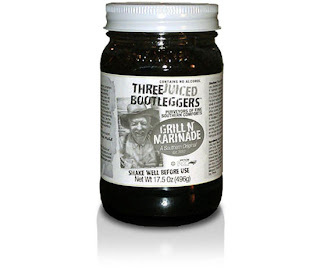 But there's a pic of a hillbilly on the jar--if it didn't look like this, I'd be surprised. Another added bonus: Mason jar packaging! So, I marinated steak (for cowboy steak), chicken, vegetables, tofu, tempeh, fish (for fish tacos), and even duck breasts in this stuff. Add a little "white lightening" or just some whiskey and you have a terrific marinade for any outdoor (or indoor) festivity. 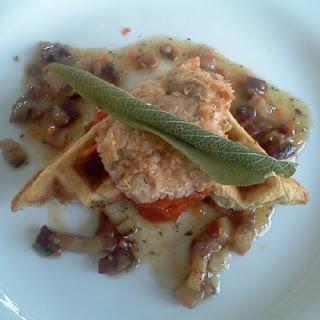 Recipes can be found HERE. I got a wild idea to make duck bacon. I Googled it and found a recipe from my foodie friend, Susan. I followed her lead but changed a few things. Like adding the Grill N' Marinade. Duck is expensive and I wanted to insure it was going to taste good when I was finished. Adding a maple syrup, salt and using hickory wood chips made my wish come true. You need to try this bacon. It will change your life. Score the fat of each duck breast. Be careful not to pierce the meat. This will shorten the cooking time and also let the marinade penetrate the duck better. Place the duck breasts in a large Ziplock bag and set aside. In a large bowl, dissolve the Kosher salt and curing salt in the cold water. Stir in the maple syrup, jar of marinade and mix until mostly dissolved. Finally add the ice to the brine, this is to keep the liquid cold to slow the salt absorption. Place your bag of duck breasts upright in a large container or pan and open it up. Add the brine to the bag holding the duck breasts. Close and cover tightly. Place in the refrigerator for 8 hours. After the 8 hours, remove the breasts, rinse and let dry 3-4 hours or overnight. Once completely dry, cold smoke according to your preferred method. How to cold smoke the duck (via Feast.com): Heat soaked wood chips on the stove top in a metal pan until they begin to smoke. Place a cooling rack or perforated pan on top, add the duck breasts, cover and remove from the heat. Smoke the meat for only 15 minutes. 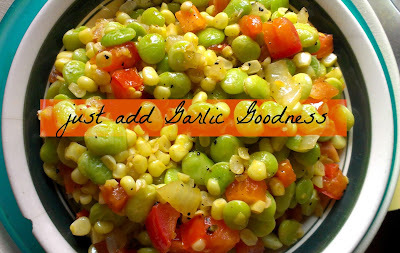 This will impart a light smoky flavor, but it is quick and easy. NOTE: I easily smoked the duck breasts for 25 minutes by periodically moving the pan on and off the stove top. 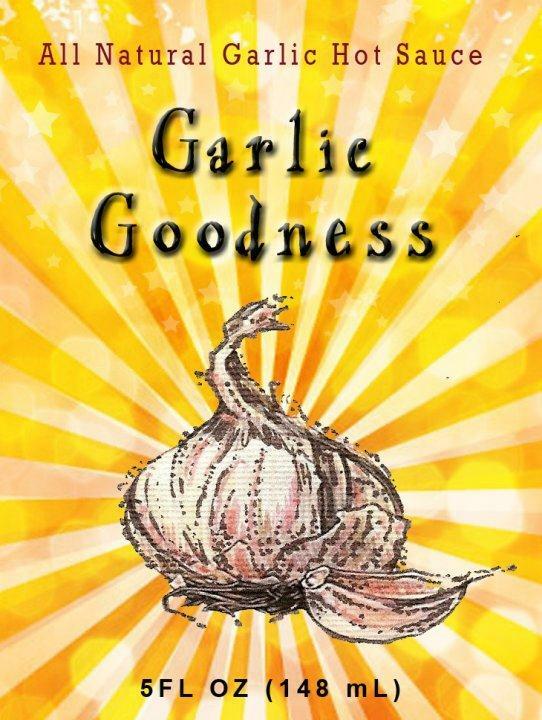 On third base is Intensity Academy's Garlic Goodness. Straight from Tampa, Florida, I met Intensity Academy's owner/founder Michele Northrup at the Food & Wine Conference in July. She was and is a Saucy Queen. She was a presenter and as she was telling her story, I was captivated by her words and her spirit. She passed out carrot key-chains and select participants won bottles of her Carrot Karma sauce. This Saucy Queen has won over 50 awards for her sauces and after one taste, I see why. Michele sent me Garlic Goodness and Chai Sweet Chili and I fell for both of them. No cholesterol, all-natural, recipes for Saucy Bang Shrimp and Saucy Shrimp Scampi are on the Intensity Academy website. My new favorite? Garlic Goodness butter. Equal parts butter and Garlic Goodness will rock your socks off. I put mine in my succotash. Order some today. You will not be sorry. In the late 1920s, there was a barbecue restaurant in Winston-Salem that was owned by Thad Garner. The only thing good about the place was a sauce. A vinegary, spicy red sauce that went well on everything. 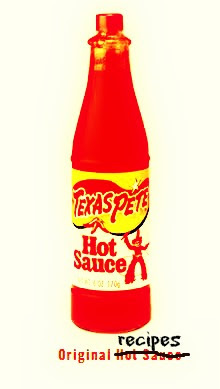 The youngest Garner's nickname was Pete and since family members wanted the sauce to have an American name, Texas Pete was born. The restaurant closed, but the name lives on. 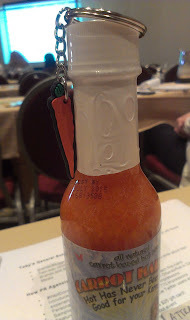 So does the legacy, the folklore and this great hot sauce. Today, Garner Foods sells Texas Pete, jellies, jams, salsas and snacks. Click on the link below the Texas Pete bottle for some Nik Snacks-approved recipes! Now it's time for the giveaway! Follow the directions and enter in the Rafflecopter below! There will be up to FIVE (5) winners this time around, so your chances of winning are pretty high! Enter today! 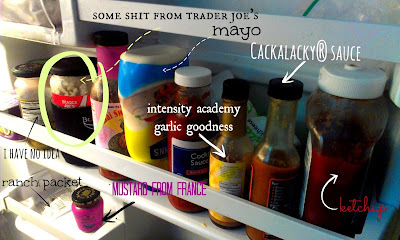 Crazy about Cackalacky and Nello Sauce. Texas Pete is a staple from Army deployments (liquid gold). Looking forward to trying rest whether I win or not. We love Nello's Sauce! My daughter will put Texas Pete on just about anything! If we win, I would love to try the marinade--that would be a new one for us! The sauces all sound equally delicious! Oh yeah, duck bacon! I still can't get over that it was by chance you ended up with my recipe! Fabulous changes! My favorite condiment is hot sauce on fired chicken,fish;it adds more flavor to whatever I'm eating. I'm looking forward to trying Provencal Pomodoro as a spaghetti sauce. Favorite condiment? 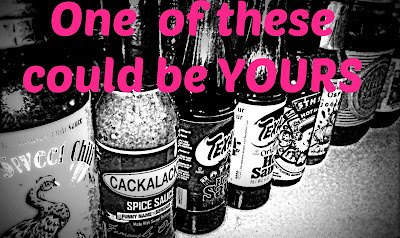 That depends on the dish... tomato ketchup is a solid go-to for fried potatoes, A1 for a bland cut of steak, Texas Pete Hot Sauce can make almost anything better! 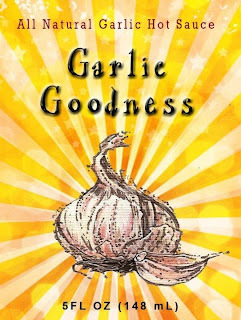 As for being excited to try - @niksnacks really sold Nello's Sauce, and Intensity Academy's Garlic Goodness blended with butter. I'm not a big condiment person but my son is. I think he would like Texas Pete's Hotter Than Hot sauce. I love a spicy Cholula sauce. I also like Texas Pete! 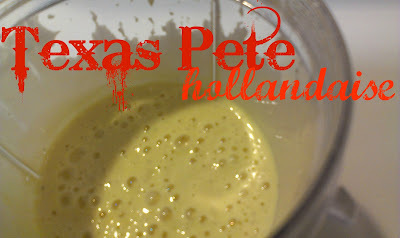 I love Texas Pete Hot Sauce. My favorite condiment is Dijon mustard. Each sauce has its own unique flavor. It really brings out the richness in the foods. I like 'em all... ! !